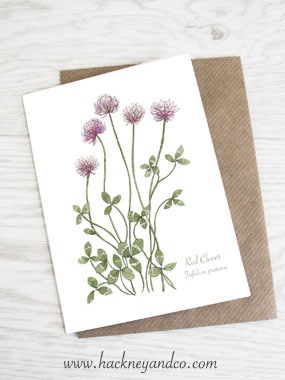 Red clover is a wild edible plant belonging to the legume family that is commonly used as food for cattle. This common edible plant has a long and colourful history. Traditional Chinese medicine believed that it was a good tonic for colds, to purify the blood, and at one time they burned it as incense. Native Americans used it as a salve for burns, as well as for bronchial problems. Many cultures have traditionally used red clover to treat whooping cough, respiratory problems, psoriasis, eczema and even cancer. 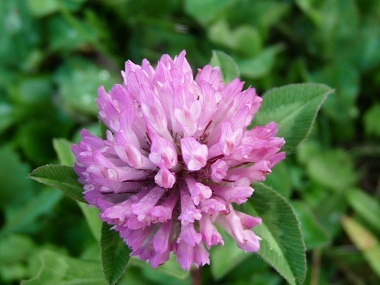 Red clover is one of the herbs in Essiac, and grows in many areas around the world. Warning: Not to be taken by women who are pregnant or by nursing mothers. Distinguishing Features: Red clover is very distinct as it has a reddish round flower head made up of numerous tubular-shaped flowers. Its green leaves have a white or pale green chevron on the upper side which helps to guide pollinator insects to the flower head. Flowers: Each flower head is about 2-3 centimetres across and consists of numerous tiny flowers. These flowers are tubular-shaped, and spread outward in different directions. Each flower has 5 narrow petals that are pink or purplish pink, becoming light pink or white toward the base of the flower head. The blooming period usually starts about late spring and can continue, depending on weather right through to late October. 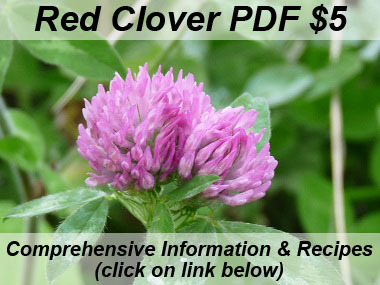 Fields of Nutrition has medicinal benefits and vitamin/mineral content of Red Clover. Leaves: The leaflets are oval or ovate and tend to be broader in the middle. Toward the centre of the upper surface of each leaflet, there is usually a chevron that is white or very pale green. At the base of each compound leaf, there is a pair of ovate stipules. Usually there are 1-3 leaflets immediately beneath each flower head, as well as several green bracts. 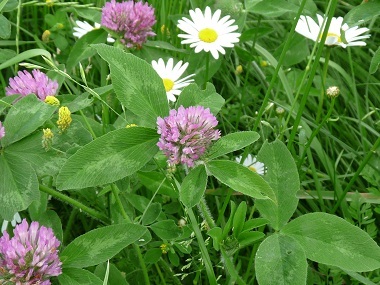 Height: Depending on conditions, red clover plants can grow up to 80 centimetres in height. Habitat: Habitats include fields, pastures, vacant lots, grassy areas along roads, weedy meadows and on front and backyard lawns. Edible parts: Although leaves can be tossed into a salad or used in a tea, the preferable part of this wild edible is the flower. Red clovers are the tastiest of all clovers although it is recommended not to eat too many of these as some people experience bloating. For more in-depth information (e.g. nutrition, medicinal values, recipes, historical information, harvesting tips, etc.) please check out our Red Clover PDF magazine.